Khuzestan is the richest region in Iran and the source of its oil, but the indigenous Arab people suffer the country's highest poverty rate. Why are the Arab Ahwazi people the poorest in Iran? To answer this question, it is important to look at the factors that have created the situation in Khuzestan province. Labour is a major factor that affects the living standards of societies. Although few human rights activists look in depth at labour issues in Ahwaz, it is crucial to look at what kind of difficulties Arab Ahwazi workers go through. A growing body of evidence shows that high labour standards play a major factor in improving living standards in many societies. Labour rights are a key component to a functioning democracy and an equitable and sustainable economy. Yet, this is not the case in Khuzestan. Racism, anti-unionism and authoritarianism are three main issues that affect labour in the province. 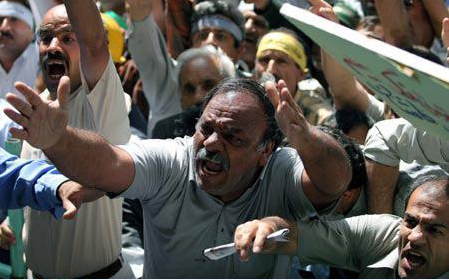 According to research by the Middle East Forum, the unemployment rate in Iran is around 12 per cent. However, the actual figure is way higher than that. During the last 10 years, only in Khuzestan has the unemployment rate has increased from 16 to 18 per cent. Around 50 per cent of Arab women and young people are unemployed. In rural areas, the overall unemployment rate reaches 20 per cent. Despite the province's fertile lands, farms are suffering from lack of investment which leaves many farmers without work. Racism is one of the main reasons for such unfair labour practices. Ahwazi Arabs are denied jobs throughout the region. A good comparison is the seven per cent unemployment rate in the Persian majority city of Dezful, compared to 31-50 per cent in Abadan and Mohammerah (Khorramshahr). A prominent example of job insecurity in Khuzestan is the sugar refinery workers in Ahwaz who recently demonstrated against the unpaid jobs and benefits. While the government blames the international economic situation, these workers have to accommodate their lives to irregular salary payments in order to survive with the very little income they have. The situation would have been different if the workers were allowed to unionise, but collective bargaining would undermine the hidden agenda of the Iranian government to target Arab Ahwazi workers. As a matter of fact, trade unionists are harassed and prosecuted for participating in union activities. Job denial and mass redundancies are not unfamiliar to Ahwazi Arab workers in Khuzestan province. In October 2011, Ahwaz Zamzam Company summarily dismissed 105 Arab workers claiming that the company was not in need of them. Yet, the lay-offs occurred at a time when Khuzestan’s provincial governor announced the creation of 137,500 job opportunities. Ahwazi Arab workers are also likely to lose their jobs if they are to be found participating in any peaceful political protests or any activities that promote Arab rights and democracy or claim for their not paid wages for months. This was shown when Ahwaz mayor Mansour Katanbaf sacked 400 Arab Ahwazi workers who participated in political demonstrations in April and May 2011. All were denied their after-service benefits. Even when the workers appealed against unfair dismissal, the cases were not resolved. The workplace is used by the Iranian government to cleanse certain ethnicities and their political views. In doing so, the Iranian government has both violated international labour laws and its own laws. The Iranian constitution states that Iranians should be treated equally despite their ethnicity or religion. Citizens should not have any privileges because of their race. However, this is not the reality and Arab Ahwazi workers are suffering because of their ethnicity. British Ahwazi Friendship Society: Human Rights and the Ahwazi Arabs. July 2007.